With purity and safety in mind, IsaOmega is a thoroughly tested, high-quality fish oil sustainably sourced from Chile’s deep, fish laden waters. Loaded with Omega-3s and featuring a tasty lemon flavour, IsaOmega softgels are an ideal supplement for improved joint, heart, and brain health. In an effort to provide consumers with the highest-quality fish oil possible, IsaOmega fish oil is harvested from small fish in an environmentally-friendly manner off the Chilean Coast. After harvesting, an advanced molecular distilling process is utilized to create a highly-concentrated fish oil rich in heart healthy Omega-3 fatty acids. 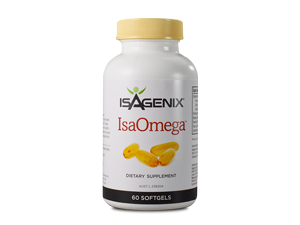 Unlike other fish oil capsules that leave an unpleasant fishy aftertaste, IsaOmega softgels are lemon flavoured, so they taste great as well. Sustainably Sourced – IsaOmega fish oil is sustainably sourced in an environmentally responsible manner. Molecular Distillation – Thanks to an advanced molecular distillation process, IsaOmega is one of the most highly concentrated Omega-3 softgels on the market today. Free of Impurities – Due to Isagenix’s strict quality control standards, IsaOmega softgels are third-party tested to ensure they are free of PCBs, heavy metals, dioxins, and other impurities. Pleasant Flavour – With a tasty lemon flavour, IsaOmega doesn’t leave a fishy aftertaste like many other fish oil options. Adults interested in increasing their Omega-3 fatty acid intake and benefitting from improved joint, heart, and brain health. Like other Isagenix products, IsaOmega Omega-3 fish oil softgels are also gluten and dairy-free. How Can You Buy the Isagenix IsaOmega?